Dear customers and enthusiasts of pens, nice to meet you! My name is Santini Giovanni and I am the founder and I manage now for over twenty years, this company. I'm glad to introduce myself to you because you see that behind a product there is someone like you lover of this beautiful object, and has chosen to do this job with a passion. If you're a pen dealer or simply a fan, if you have any requests, or just to share your impressions and suggestions , write me I'll be glad to answer you. Thanks for making it possible with your interest in our work. 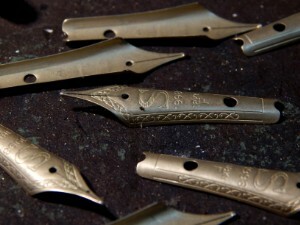 All the pens have a heart and their hearts are their writing section. Since I started to produce my pens my dream was that this heart was all ours, produced by us, from a small company but the true expression of our italian craftmanship. Our "heart" is made of a 18 kt solid gold and requires more than 16 manual steps before being tried at the last step, when touching the ink. starting from the small squared gold piece, which is laminated in several steps, to make its flexible tip yet solid but his body thin and elastic, and one micro bead of Iridium, smaller than a millimeter is welded on its tip. The Iridium is a metal more precious than gold and so durable that will allow you to write the whole life. But do you know what is the most precious thing? It is the hand of skilled craftsman, who passionately and fully manually try the tip of the nib smoothing with wisdom and experience its tip into countless positions of his hand with one ambition: to make you writewith pleasure. This is our work, our passion and this way we thank you for choosing our own creation.